This section is normally only set up once when a project group is first started. The user will set the preferred operating mode, Steady State or Dynamic, temperature and pressure limits, etc. Description: This is Optional. A description of the configuration file may be entered here. This should be kept short and meaningful as it is used in the Open Configuration Dialog box - xxxx.cfg(description). Calculation Selection : see heading below for more information. Temperatures and Pressures: see heading below for more information. Default Species Model:The Species Model determines how the properties of streams containing a mixture of chemical compounds are calculated. This is selected from the drop down list. The species models in the list will be determined by the SysCAD license. Users with the Alumina add-on will have additional Bayer species models enabled. Some users may also have customised species models. Direct - The units will have no surge and will behave in exactly the same fashion as a ProBal model. Inline - The units have surge and allow the user to implement internal level control in the unit. Buffered - The units have surge and SysCAD uses an integral method of solving the unit in the network. Transfer - The user can specify the flow capacities in pipes. Simple - The flow is calculated based on a relative pressure network, used when absolute pressure values are not available. Linear - The flow calculation is linear. None - For user wanting a mass balance only, using this option provides a faster calculation speed. However, do take note that this would result in all streams being at 25°C. Note: The user may still change the options in individual units within a project (see Settings and Options on the Info Tab), as these settings are for the default behaviour when a project is created using this configuration file. The Max Complexity will set the maximum complexity allowed when using this configuration. For example, the user may set the default heat calculation to None and the Max Complexity to Rigorous. 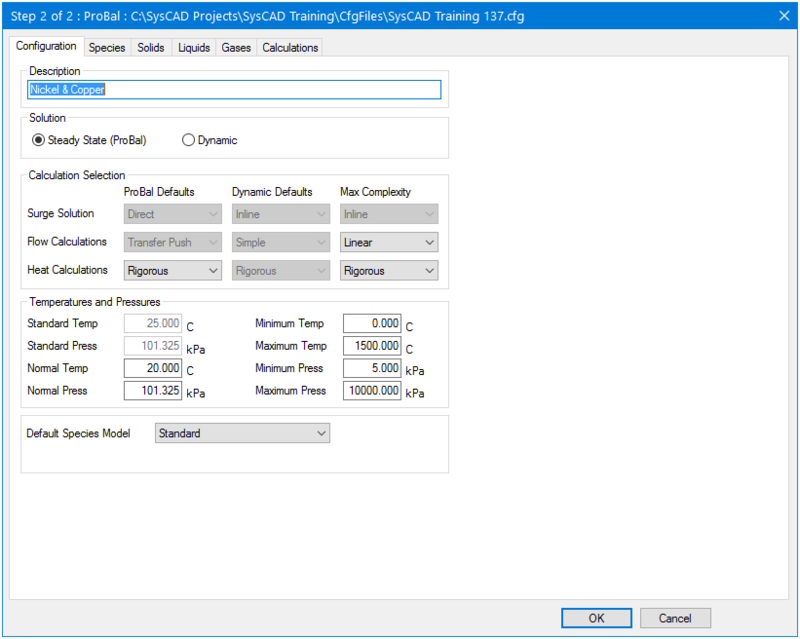 All projects using this configuration file will start by default with no energy calculations, but the user may still change the individual project setting to have Rigorous heat calculations. However, if the user also set the Max Complexity to None then the user would not be able to change the Heat Calculations for any project from None. The standard temperature and pressure are in degrees Celsius and kPa absolute, respectively. These fields cannot be modified by the user. They are hard wired to 25°C and 101.325 kPa, respectively. Normalised volumetric flowrate is calculated using these temperature and pressure values in degrees Celsius and kPa absolute, respectively. The user may change the default values, if required. The range allowed for normal temperature is -10 to 100°C. The range allowed for normal pressure is 50 to 200 kPa. These values are the expected minimum and maximum values for the projects using this configuration file. The temperatures are in degrees Celsius and pressure is in kPa absolute. The user should ensure that the values given here will be appropriate for the projects using this configuration file. The range allowed for minimum temperature is -273 to 20°C. The range allowed for maximum temperature is 100 to 5000°C. The range allowed for minimum pressure is 1 to 22000 kPa. The range allowed for maximum pressure is 110 to 90000 kPa. For example, if the user will be developing a smelter project, the maximum temperature may be 2500°C. However, if the user is developing a plant that uses ammonia, the Minimum temperature may need to be as low as -33°C. Note: The temperature limits defined above limit the temperatures in SysCAD models. The temperature of a feeder can not be set outside these limits. The temperature in a pipe may drift outside these limits but on the next mixture of feeds (eg. feed to a unit), the temperature will be set to no less than 10 degrees below the minimum temperature and no more than 10 degrees above the maximum temperature. These limits will also be applied in a reaction block. This page was last edited on 12 May 2017, at 00:54.